We’ve all had an experience where staying upright below decks is like performing funky dance moves due to waves and wind pushing our boat over or we find our foot slips when we try to maneuver from the deck to the dock to tie up. What about using the head while underway? That’s never a pretty or easy event! As a yoga instructor I have identified 5 of the most useful Yoga poses that we can practice to make our life aboard a little more agile, balanced and capable! The first pose is Vrksasana or Tree Pose. This is a great balance posture that helps us strengthen our legs and core so that our balance will be better and where is balance most challenging – that’s right! At Sea! When the boat is rocking and swaying back and forth having good balance is a must! This pose can even be practiced while you are brushing your teeth! Give it a try! The counter is right at arms reach if you need it! Start standing on your right foot and bring the left foot up onto the calf. (It doesn’t have to go as high as in this picture – start lower!) Press the foot into the standing leg. Tighten your tummy and pull your bum in. See how long you can hold it! Then do the other side! I hear it from my students ALL the time – As we age our balance seems to be one of the first things to go! Well, you CAN get it back – you just have to practice! Another great pose is called Adho Mukha Svanasana or Downward Facing Dog. This pose is usually done on a flat surface. Spread the fingers really wide, lower the head between the biceps, lift you bum high and stretch the hamstrings to work the heels toward the ground. They don’t have to touch the ground just try pressing the heels down. It’s a great stretch for the legs, back and arms! When I saw this photo I immediately imagined trying to keep our boat from bumping into the dock because someone forgot to put the bumpers down! I know I’m not supposed to get between the boat and anything else but I don’t really want to lose any more gelcoat! It’s also a good pose if you have to climb over a ton of gear to reach some far corner looking for a bilge pump! No one’s ever had to do that right? LOL! This one is called Virabhadrasana III or Warrior 3. This is a balance pose again but there is also a lot of work going on in the glute and thigh of the raised leg. And we need strong legs at sea! The goal with this pose is to bring the body parallel to the deck – It’s harder than it looks! See the arms clasped and pointing forward? Looks like a wind indicator to me! Now, I know I don’t spin in the wind easy and I’m sure as hell NOT going to get on top of the mast but this pose could also be used to signal land if you’re on the other side of the boat and your partner can’t hear you. Especially after you’ve yelled at him twice and he still doesn’t understand – I DARE you to try this! Watch his/her jaw drop! Then send me a picture of YOU doing it! Utkatasana is also known as chair pose. Hmmm, I wonder where we can use this on a boat? Maybe the head? I HAVE been know to call this “Porta Potty Pose.” We all know that sharing a head with other people means that sometimes the seat is not exactly dry so using this semi-seated position keeps our rear clear of any unpleasantness. ‘Nuff said. I think you get the picture…..Sorry couldn’t help myself! And finally, Savasana or Corpse Pose. The goal of this pose is total relaxation, no work, no worries, just rest and it’s how I end every yoga class. This pose comes in VERY handy when I need to flake the jib! I find by lying on the jib it stays low to the deck, the wind doesn’t catch it and it gives me a minute to rest before moving on to my next task. This pose can also come in very handy if you are feeling a little bit queasy – just turn your head and look at the horizon! Or if the sun is out and you just need a few moments to yourself! it’s my favorite spot on the boat! All joking aside, Yoga is a great compliment to sailing. It helps to keep me strong, balanced and fit. All things that help me be a better sailor, partner and part of the crew! And I can do yoga anywhere! If you haven’t given yoga a try I totally recommend it. I only started about 4 years ago and it’s done wonders for me! I wish you Fair Winds, Following Seas, and Flexible Forward Folds! Previous If You Could Be Anyone, Who Would YOU Like to Be? Why, thank you, thank you very much! this is so fabulous I just hardly know how to respond. 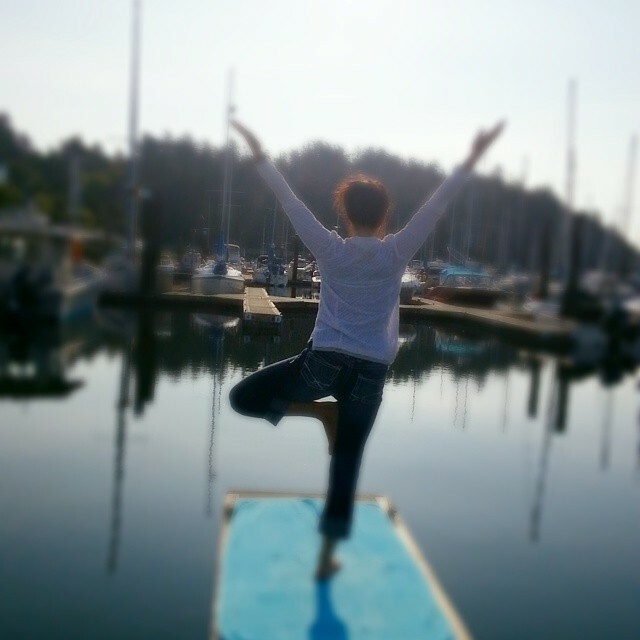 happy yogini here, although not getting nearly as much practice in as I’d like lately…gonna blame it on passages and rolly anchorages but really, I just need to do.it. But you give me tremendous inspiration. thank you! I’m so glad you like it “happy yogini!” It is difficult to get time in to practice – even for those who teach like me. I have been known to roll out my mat on the finger pier though or go for a walk to find some nice grass —-ooooh grass!! And practice there! You are more than welcome! Hugs!